Well, it's big. In fact, this is the biggest clubhead on a 3 wood that I've seen. It is a monster 200CC clubhead that is shaped like the wing of a fighter jet. The idea is to make the club more aerodynamic and wind-resistant so that when you are wrapping it around your head and swinging out of your shoes, the club will slice through the air like an F18 chasing a bogey. I like this 3-wood for higher handicappers and slower swingers that are looking for a forgiving clubhead and more clubhead speed. I think you will really like how it looks at setup. Set the big ol' jet wing behind the ball at address, and you should have lots of confidence that you are going to make contact, especially hitting it off of the tee. The ladies will also really appreciate the super lightweight shaft. For those of you with slower swing speeds, this combined with the aerodynamic clubhead should give you more distance then you've ever had. For those of you better golfers, I don't like this 3 wood for hitting the ball out of tight rough or trying to work the ball in a tight, tree-lined fairway. 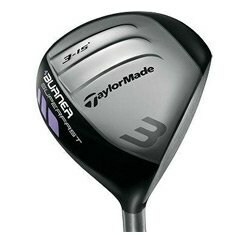 I would recommend the Lady R9 Fairway Wood because of the more traditional shape.